Last week I renewed my criticism of the CREG reports for sloppy forecasting. I also noted, to their credit, that the latest CREG report has gone a little bit more realistic in its forecasting. It is too early to tell whether this is a genuine shift for the better, or a temporary aberration from their business as usual. Let us hope for the former. Indeed, there was a funding gap in 2016, but it was not 90+ percent. The EAD funding-gap chart only takes into account personal taxes, but why? Do taxes paid by corporations vanish into thin air? Do they materialize out of thin air? I recently debated this issue with someone. This person suggested that businesses just add taxes as a mark-up on their prices. I then asked "does that not reduce sales?" whereupon this individual plainly replied "no." Evidently, this person has never worked in the private sector. For the answer "no" to make sense, a business would have to have a price margin on its market. But if it did, that would mean it was not charging the highest price the market could afford. No business does that, especially not over a sustained period of time. The plain, simple fact of the matter is that businesses do not add taxes onto their prices. They subtract taxes from their prices. The taxes they pay are taken out of income for employees, owner and managers; they are taken out of purchases of inputs and consulting services. Taxes on businesses reduce investments and the number of employees. To the point of the funding-gap chart: every dollar a business pays in taxes is produced through the toil, sweat and tears of employees and managers, and through owners' risk-taking. To pay the taxes on a business, all the people in that business have to literally work for free for part of their time. Once they have paid those taxes, they have to work yet more hours to make the money that is paid as taxes on income, property and their spending (sales, excise and use taxes). Plain, simply and brutally: business taxes are paid by individuals in the same way as personal taxes are. But wait - these taxes only amount to 35.6 percent of total revenue. Does that not mean we really do have a funding chart? There is one last revenue item: federal funds. In 2016, the state of Wyoming received just over $1.9 billion in funding for federally sponsored programs such as Medicaid, transportation, welfare and school lunches. In that amount is also included severance taxes owed to the state by the federal government. At this point the proponent of a funding gap could gloat and say "See, I told you! That's free money!" Unfortunately, it is not. 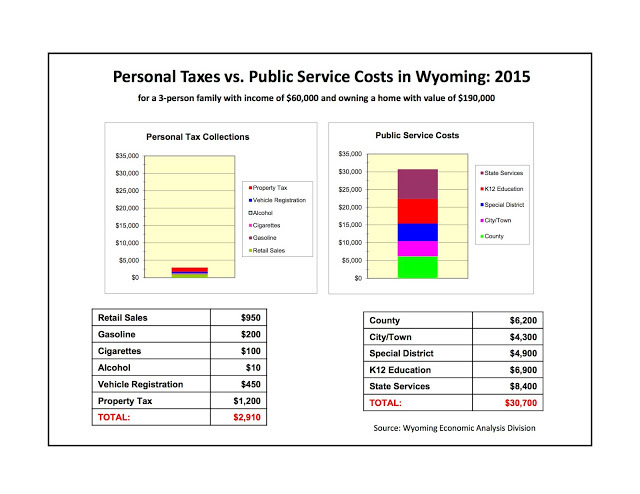 That same year, Wyoming residents paid just over $2.8 billion in personal federal income taxes. In other words, what we got back from the federal government is approximately two thirds of what we paid in. Bottom line: our government is more than generously funded. The only gap in our state and local government finances is the result of decisions by our legislators to spend more than what they take in from us.